We had the pleasure of speaking to Jane Jensen, who participated on the development of minor works such as Eco Quest and big adventure games such as King's Quest VI in Sierra, but whose biggest merits come from her own adventure game series: Gabriel Knight. Considered by many people as the best series of the genre, Gabriel Knight baptized Jane Jensen as she's today worthy known: as the "Queen of the adventure game". Aventura y CÍA: Gabriel Knight 3: Blood of the Sacred, Blood of the Damned was the last "great adventure" by Sierra. We haven't got much news (in the adventure gaming world) about the members of the missing company from Yosemite. On the other hand, Jane Jensen does not seem to be wasting her time. What have you been doing in these three last years? Jane Jensen: I've been working primarily on one big novel, Dante's Equation, which is currently slated for release in Spring of '03. It has been a real challenge for me and has taken an ungodly amount of time. I also took a break at one point and wrote a second, smaller novel which is a romance novel. The theory is that if I have several different "careers" going at once, I might actually be able to earn a living with this writing business. From her passion for narrative, numerous influences and her attachment to pure mystery her star character was born: Gabriel Knight. AyC: Your creation, Gabriel Knight, was (and actually is) very acclaimed and praised both by the critics and also the players. Many people have said it is the most perfect adventure series, even better than Monkey Island or Leisure Suit Larry… How does it feel to have such a success? And what is the formula? JJ: I think one thing that has really worked for the Gabriel Knight series was having the format be a detective/mystery series. A detective naturally solves puzzles –that's what they do. So the puzzles in the game can be integrated into the plot in a much more natural way than is the case with a comedy, for example. The other series you mentioned are all lighter comedy series. That's a terrific basis for an adventure game –silly and fun. But I think Gabriel Knight has stood out simply because it has darker, more serious and adult storylines. AyC: Let's have a look at the past… In 1988 your at that time incipient career as a writer was interrupted when you got the games Manhunter 2: San Francisco and King's Quest IV. What did you see in adventure games, that you liked so much, and made you leave your –until then– vocation? With Eco Quest: Search for Cetus , Jane Jensen could stand out at Sierra On-Line. It supposed the ultimate opportunity to make her talent public. JJ: I've always loved puzzles, and those early games were a revelation for me –that you could combine puzzles and stories and graphics in that way. It also seemed to be something that I would be well suited for since about half my brain is sheer geek/programmer and half is storyteller. I guess the real thing that made me "leave" writing at that time, though, was that I applied for, and got, an actual job as a game writer. At that time I was unpublished and not making anything on my fiction. My "day job" was as a programmer and I lept at the chance to do something more creative to earn a living. AyC: Then you wrote Sierra On-Line and were finally replied and hired by the company that made the first games you played. When in 1991 you arrived to the firm of the Williams, what were your ambitions and where did you wanted to go? JJ: There were a small number of us hired at that time by Sierra to be writers –dialogue writers and so on. We were never meant to become game designers. But, naturally, that was the ambition we all had. We wanted to design and write our own games. AyC: When you began to work at Sierra, you wrote manuals (like our friend Josh Mandel) and participated in the design of Eco Quest, a game rather different to your magnus opus. How was the transition from spending time face to face with the challenge of the blank page of a narration to the challenge of designing an adventure game? JJ: It worked out quite well because I didn't have too much time to "think" about what I had to do. I was in a work environment and I simply had to produce. There was no time to sit and stare at a blank page. The mechanics of design was something that I really enjoyed and picked up quickly, again, because of my programmer background. It was actually easier for me, and in some ways still is, to approach a story from a very logical, step-by-step, IF THIS THEN THAT perspective than it was to sit down and spew out creative prose. In fact, I think game design really made me a writer. Up until then my fiction was fairly unfocused. AyC: After Eco Quest, King's Quest VI came up, a project in which you worked together with Roberta Williams, and that made the definite push to bring to reality the idea of Gabriel Knight. I suppose that you were asked this question many times, but what is the origin of the idea of the Gabriel Knight series? We know that you are a fan of Anne Rice and Stephen King's novels, and we see the influence of Rice in the New Orleans of the game, and the character of a frustrated writer of King's books in Grabriel Knight himself, but this could be considered as just a little homage to both writers. What elements of the games are product of your imagination and what were born from the mythology, from other novels or from the large amount of historical documentation you have? 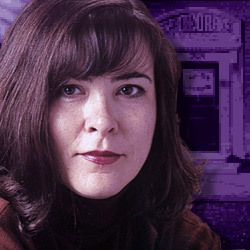 Jane Jensen went direct under service to Roberta Williams when working on the design for the sixth instalment of Sierra On-Line’s most emblematic saga. JJ: I am a long-time reader of Rice and King, but I think Gabriel Knight was almost more influenced by graphic novels –Hellblazer and Sandman in particular. The idea for the series started out from the thought that a detective series would provide a natural basis for puzzles. But I didn't want to do "just" mysteries, I wanted more horror, so that lead to the idea of a paranormal investigator. Initially, Gabriel Knight was going to be a paranormal researcher, a professor. But as I began to develop the storyline for the first game, and had the ideas about using voodoo and tying that in to a backstory involving a Salem witch trials-like story and Gabriel's ancestor, the idea of the Schattenjagers was born. The storyline for the first game also brought out the idea that his family was cursed and he didn't know he was a Schattenjager, etc. Really, what Gabriel is now developed slowly as I pieced together that first plotline. AyC: One of the most attractive things in the Gabriel Knight series is the care and the meticulousness you have put in the script, yet a few people think that you have put so much efforts in the plot that the puzzles (specially in the third part of the series) are not that good. What do you think is more important, the story or the puzzles? It could be said that John Constrantine and Gabriel Knight are part of the same guild… Jane reassures it. JJ: I have always put a great deal of effort into puzzles because I love clever puzzles. I have always thought that Gabriel Knight had some really original puzzles, such as the drum and voodoo codes in Gabriel Knight 1 and the tape splicing puzzle in Gabriel Knight 2. In Gabriel Knight 3 probably more effort was put into the puzzles than in either of the first two games. The entire "le serpent rouge" riddle/puzzle was really VAST. It took an enormous amount of time to work that out and was tied into the very landscape of the game. I always found it odd that reviewers hardly ever mention the puzzles –they always talk about story! Oh, well, can't really complain about that [smile]. But yes, I do put a LOT of time and effort into puzzles.